During yesterday's Intel-hosted Data-Centric Innovation Day in Santa Clara, the firm launched over 50 new processors. I wrote about those data centre and corporate / enterprise targeted Xeon processors (and more) yesterday evening. Intel reckons that processing is just one out of three essentials to a modern data-centric business. The firm asserts that as well as processing data faster than ever, companies need to consider carefully how they move and store data - in an optimised system. With this in mind it presented products last night designed to make moving and storing data faster and more efficient than ever. 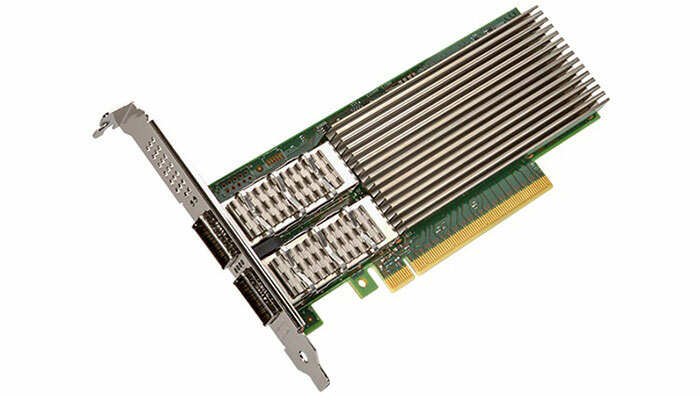 Probably the highlight of the storage portfolio expansion was the launch of the Intel Optane DC persistent memory DIMMs. Intel heralded these devices as delivering "breakthrough storage-class memory capacity to the Intel Xeon Scalable platform." With its new processors and this memory, Intel says that users can benefit from "faster-than-ever analytics, cloud services, virtualization and next-generation communication services". Intel Optane DC persistent memory can be mixed with traditional DRAM in systems (using a standard DDR4 slot) delivering up to 36TB of system-level memory capacity. Thanks to its disruptive design, providing a persistent memory tier, allowing data persistence in main memory rather than on disks, in-memory software can work even better to garner insights from massive data sets. 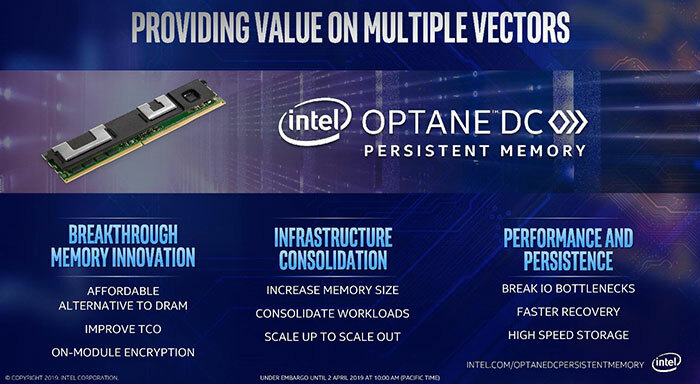 In addition to the new Optane DC persistent DIMMs, Intel launched the dual-port Intel Optane DC SSD D4800X (NVMe), claimed to deliver 9x faster read latency compared to NAND dual port, under write pressure. 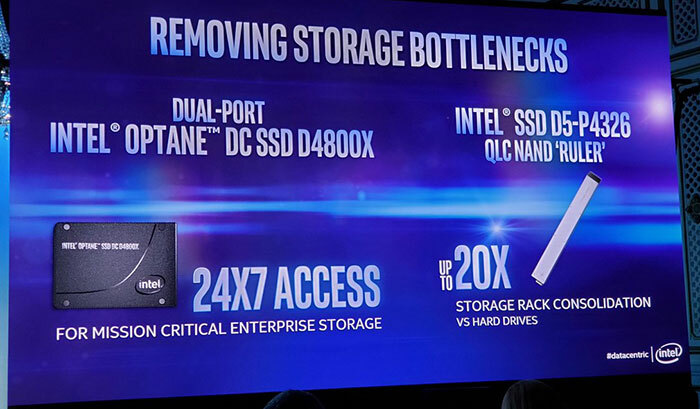 Furthermore, the new Intel SSD D5-P4326 'Ruler' SSD (QLC 3D NAND) enables up to 1PB of storage in a 1U design. Another essential piece of the flow chart for data processing is connectivity, for moving the data around. Last night the Intel Ethernet 800 Series controllers and adapters were introduced. These devices are capable of supporting networking speeds of up to 100Gbps, and offer features such as Application Device Queues (ADQ) for improved application response, latency, and throughput. Intel Ethernet 800 Series controllers and adapters will start to ship from Q3. Lastly, the Intel Wi-Fi 6 AX200 with 802/11ax Wi-Fi M/2 card has launched, separately to the Data-Centric Innovation Day announcements and launches. The wireless NIC, previously codenamed 'Cyclone Peak', will be available in the M.2 2230 and M.2 1216 form-factors and supports 802.11ax over 2x2 MU-MIMO antennae, with a peak bandwidth of 2.4Gbps. Both 2.4GHz and 5GHz bands are supported and the card supports Bluetooth 5.0 as well. is AMD in trouble after the launch of Optane DC tech? Not really, Optane still doesn't compete with memory and is only really suitable for specific use cases. I still see extreme value in a database running in ECC NVRAM because if there is a power issue the database will persist. Sure it can contain massive data sets but the IO latency means any rapid access data for crunching is limited. I can see the benefits of not having to load or unload ram modules, having that information already loaded in and persistent is probably of some benefit. I guess it depends on the latency of accessing the Optane DC memory and if that is comparable to standard DRAM latency. Delving through a few links it's not something Intel is advertising openly. Optane latency is still an order of magnitude slower than RAM and they keep that quite close to their chest with no official numbers. Basically it cannot replace memory but it is an excellent middle ground between ram disk and fast storage for tiering to memory. It's better than holding an entire DB in memory for resiliency but worse for speed of access. I feel NVRAM will be the new thing over the next few years and Optane/competitor will go through the DDR 1, 2, 3, 4 latency decreases over time. It was an interesting promise, but I think if they were going to get it working they would have by now. Databases are supposed to fit in RAM and then they just have to write updates out to storage. You have to write updates to storage anyway, or you get the worry of if the mainboard dies how do you know you can plug the Optane sticks into another board and get the data back? I have difficulty trusting onboard RAID controllers for that reason.